The apparently barren ice of the Arctic can host huge bright green blooms of microscopic plantlike organisms underneath it — all hidden from satellites — suggesting that the Arctic Ocean is far more productive than previously thought, scientists with a NASA-sponsored expedition have found. However, it remains unclear whether such fertility could have unexpected downsides for life in the Arctic, researchers said. The single-celled organisms in question are known as phytoplankton, which possess the green pigment chlorophylljust as plants do, helping them live off sunlight. They are vital to life in the seas, serving as the basic food source for many ocean animals. Indeed, they are key to life on Earth — they account for about half of the total oxygen produced by all plant life. 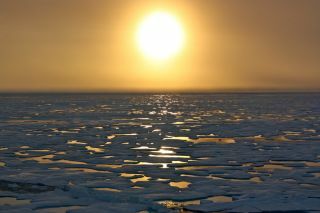 Phytoplankton blooms spring up in the Arctic during the summer, when the sun is constantly above the horizon. Scientists have largely assumed that the growth and amount of phytoplankton was negligible in waters beneath the ice there, although there were hints of phytoplankton blooms under the ice in the Barents and Beaufort seas and the Canadian Arctic Archipelago. "As someone who has been studying polar marine ecosystems for 25 years, I had always thought that the idea of under-ice phytoplankton blooms was nonsense," said researcher Kevin Arrigo, a biological oceanographer at Stanford University in California. "There is simply not enough light getting through the ice into the ocean for them to grow." As it turns out, phytoplankton not only flourishes under thick layers of ice, but grows in numbers about four times higher under the ice than in the open water. "The idea that phytoplankton can not only bloom under 3-foot-thick ice but that they can reach numbers that put their open-water counterparts to shame was a complete surprise," Arrigo told OurAmazingPlanet, a sister site of SPACE.com. "It means we have to rethink many of our ideas about how the Arctic Ocean ecosystems function." On July 10, 2011, Jens Ehn of Scripps Institution of Oceanography (left), and Christie Wood of Clark University (right), scooped water from melt ponds on sea ice in the Chukchi Sea during the NASA-sponsored ICESCAPE expedition. Arrigo and his colleagues were in the Arctic on the ICESCAPE cruise — ICESCAPE standing for Impacts of Climate on EcoSystems and Chemistry of the Arctic Pacific Environment — to study how ocean life was responding to recent declines in sea ice levels. The expedition is sponsored by NASA and took place during the northern summers of 2010 and 2011. "Part of NASA's mission is pioneering scientific discovery, and this is like finding the Amazon rainforest in the middle of the Mojave Desert," said Paula Bontempi, NASA's ocean biology and biogeochemistry program manager in Washington. Simply reaching the research site was among the expedition's biggest hurdles, researchers said. "As the ship moved from the open water into the ice pack, the instrument that tells us how much phytoplankton are in the water started to produce very high numbers," Arrigo said. "I thought this was odd since there shouldn't be phytoplankton under the ice. I actually feared that our instrument was malfunctioning." They discovered a massive under-ice bloom that extended for more than 60 miles (100 kilometers) into the ice pack on the Chukchi Sea continental shelf. Based on their findings, productivity in the area they studied may be 10 times higher than current estimates of productivity there that are based solely on open-water measurements of Arctic phytoplankton. "Our results show clearly that the Arctic Ocean is a much more biologically productive place than we previously thought," Arrigo said. The reason that phytoplankton can flourish under the ice is because the Arctic ice pack has thinned in recent decades, riddling it with meltwater ponds at its surface. As such, "a lot more light can penetrate through the ice into the ocean below," Arrigo said. "It's not nearly as dim as it used to be." "Some have claimed that the bloom couldn't have developed under the ice — that it had to have begun in open water and drifted below the ice," Arrigo said. However, "given the currents and known ice motion, we have shown that this isn't possible." Although one might assume that such productivity will be good for the Arctic, its specific impact remains unclear. For instance, phytoplankton blooms now seem to occur earlier than normal. Animals that fly or swim to the Arctic to depend on these blooms may have difficulty adjusting to an earlier season. "It is often assumed that when it comes to biological food production, more is better," Arrigo said. "However, a more productive Arctic is not necessarily an improved Arctic or a better Arctic. If the Arctic becomes increasingly more productive, some members of the ecosystem will benefit while others will not. There will be both winners and losers. It's too early to tell who these winners and losers will be." Now, researchers want to figure out how widespread under-ice blooms are and determine their impact on the polar marine ecosystems. However, "this will be difficult because the Arctic can be a pretty inhospitable place and sampling deep within the ice pack, which is what this research would require, is challenging, even for an icebreaker," Arrigo said. The scientists detailed their findings online today (June 7) in the journal Science. This story was provided by SPACE.com sister site OurAmazingPlanet. Follow OurAmazingPlanet for the latest in Earth science and exploration news on Twitter @OAPlanet. We're also on Facebook and Google+.